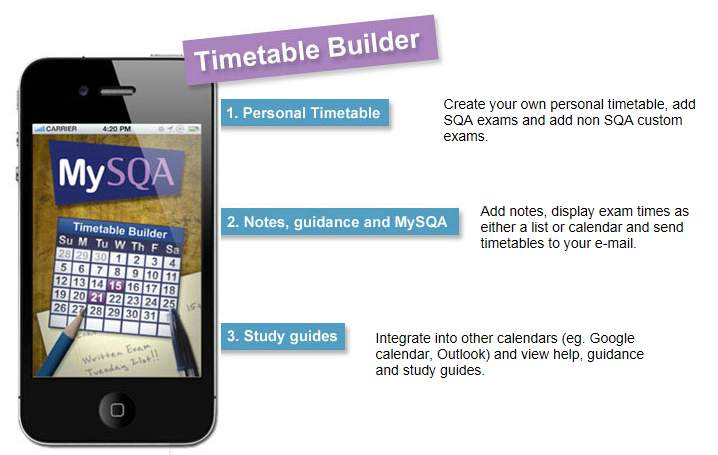 The SQA offer useful mobile device apps to help you with your studies and upcoming exams. The apps are free to download and available on a variety of platforms such as Apple iOS, Android and Windows Phone. Please follow the links below for more information about how to download the apps. Create your own exam timetable using our online and mobile personal timetable builders. You can view your exam schedule at a glance, add notes to exam entries, e-mail the timetable to yourself or a friend, and even integrate it into other calendars using iCal. 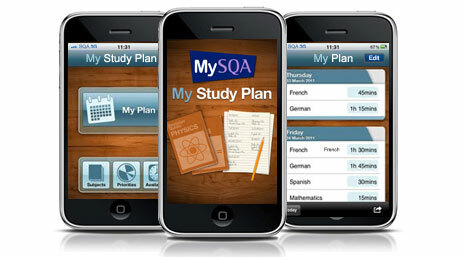 Create your own study plan on iPod Touch, iPad or iPhone with our MyStudyPlan application. This great service lets you import your exam schedule, enter your time availability and use the information to generate your study plan.